While F/O George Graham, P/O Leonard Martin and F/S T.J. Bright along with F/O Smith eventually made the long trip back to Britain. For F/O Harry Smith his first thoughts on landing were to dispose of his parachute, May West vest and other flying gear. As an added touch he rubbed mud over his badges and flashes to make them less noticeable. Crews were trained on escaping, hiding and interrogation techniques sometimes in lectures on base given by former evaders. Aircrew also received hand to hand combat training prior to or when they arrived overseas, it seems to have varied. After putting some distance between himself and where the he had come down he settled in to spend the rest of the night in a gully. He continued on in his travels the next morning, eventually in hopes of getting help he approached a young cyclist. Not knowing what reaction to expect from the cyclist he went ahead explaing he was a shot down airman. The teenage boy seemed to have no difficulties in believing the airgunner and led Smith to his house. After proving him with a meal, shoes and a raincoat the boy had Smith hide in a loft for the rest of the day. In the night the teenager guided the airman to the road to Lisieux and informed him of a house along the way where he could also find more help. At this house he was given food and shelter. Then the next morning he was told to move on. 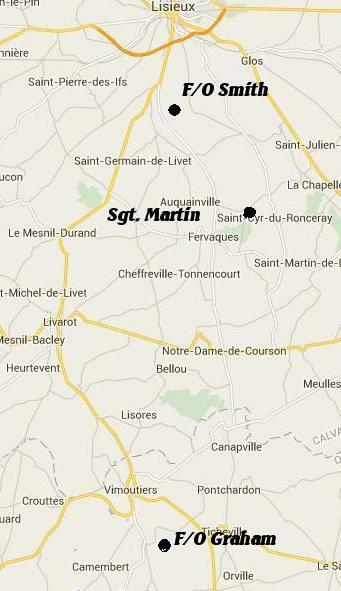 Smith followed the road to Lisieux, where he circled the fringes of the town to see what the situation was. What he found was that Lisieux was full of German troops. He decided to start back the way he had just come. Along the way back he fortunately met another young man on this road, he too promised to help Smith. The man hid Smith in a barn overnight. The next day the airman spent hiding in the woods nearby. Another hiding place was found for him, another barn, where he remained for two days while plans were made to get him away. The plans that his helpers came up with were mostly impractical, until they finally came up with what was thought to be the best way to have Smith on his way. Given a set of civilian clothes, along with a railroad ticket he was taken to the train station. A guide was to meet him there and help him on his passage to Honfleur, which would bring him closer to the coast. Smith waited for the guide who never showed up as far as Smith could tell. Now faced with trying to make it on his own, he decided instead to go back and find the three men who had been helping him. In his confusion in the unfamiliar surroundings he ended up taking the wrong road out of Lisieux. After an undetermined length of time his hunger and thirst forced him to try his luck with knocking on doors. His plea for help to a Cabinet maker brought him both food and shelter for the night. In the morning they were visited by an English speaking lady. Who left to make arrangements. When the lady returned she was accompanied by a man, he took F/O Smith's I/D card then left him. After what seemed a long time the man returned with a stolen German bicycle. Now began an odd journey and one that could have had disastrous effects. The man took the airman to his home, but he did not travel directly to the house. Instead the man made stops along the way showing off his new charge. All this was making Smith very nervous. What lay ahead at the man's home would have made him even more nervous. Arriving at the man's home Smith realized it was being used as a German Officers billet. Smith could not see the crazy reasoning of hiding him in such a place and was not in a mood to go along with this plan. He did however end up spending the night in the man's kitchen. The next move was also one in which a strong set of nerves would be needed. He was told the papers and assistance he would need were at a house on the other side of a forest in which the German soldiers were working at cutting down trees. To get through the forest Smith and one Frenchmen both had to be disguised as part of a work detail. Loaded down with tools they had to weave their way through the woods without attracting the attention of the German troops. Which they managed to do successfully. There at the house he waited another two days while for help from the Marie-Claire escape organization. They in turn brought him through to Spain. From Spain he was guided to Gibraltar and by late December was back in England.